In Ukraine, we often hear that the country needs more startups — that product companies are good for Ukraine, while outsourcing ones are not. We can argue a lot about the advantages and weaknesses of various business models if we don’t take into account the fact that the product ecosystem is a logical part of the service ecosystem. Israel’s IT market perfectly exemplifies it. About 15-20 years ago, Israel was an outsourcing appendage of the US. Yet, nowadays Israel’s economy is one of the most innovative economies in the world — often compared to Silicon Valley. In fact, similar transformation processes take place in many countries and even in certain companies. To prove it, I am going to describe a project we have been developing at GlobalLogic recently. There is a unique customer that we have been working with for nearly 10 years: Avid, the developer of the world’s most preferred solutions for the television, music, and film industries. Avid’s products are used to create numerous movies and record and broadcast concerts and many other events (such as the Olympic Games or the world tours of music stars). The purpose of Avid’s solutions can be understood better if we look at one of the areas of the company’s expertise. Imagine a studio designed to support a full cycle of TV news production. To air a 30-second TV program, say, about Jamala’s triumph at the Eurovision song contest, the studio performs a colossal amount of work on data transformation. First, the news studio downloads the official stream of the concert or its own recording shot at the venue (in both cases, tens of hours of raw video). Next, someone describes the contents of all the recordings and puts them into the studio multimedia library. Another person outlines the subject of the story for the event coverage. Someone else prepares a text that the speaker would read. Somebody cuts the video for this story, handling hours of recently shot video, as well as some old recordings that show the first performances of the singer. Finally, another specialist adds infographics to show voting results. When this story is on the air, the TV channel’s logo is put over the video, and other pieces of information appear in a ticker. It sounds like a very complicated process, yet,Avid’s solutions automate the procedure significantly. On the other hand, automation brings some technical constraints. For example, within the above described process, you cannot add a video from your flash drive or a smartphone. Avid experts considered this problem but couldn’t solve it within its existing product roadmap or its global plans. This issue — along with Avid’s recent launch of an ecosystem for third-party developers — inspired us to develop our own product called FileSystem Connector. 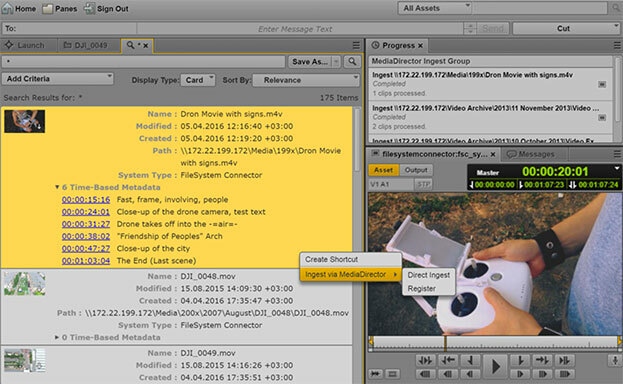 The idea is simple: using the platform API, we enabled users to (1) add standard media files to the production system, (2) index and search for the files within external media or network storages, and (3) automatically convert the files into convenient formats and register the files in the system. It may sound simple, but only because all the technical aspects are hidden from the user. 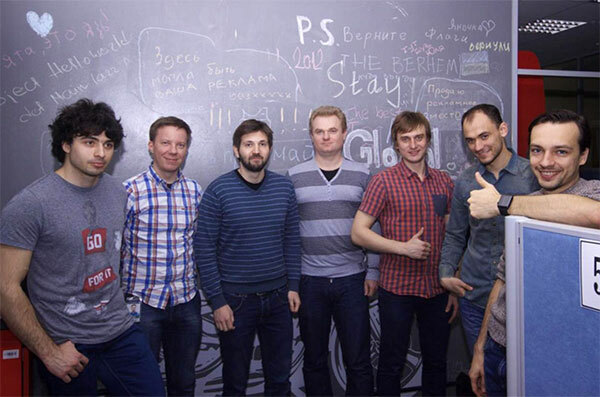 At the time, we managed to justify our idea to GlobalLogic’s management team and get its support. We were given a kind of a carte blanche: a team of six and several months of time. Within that term, we have created a full-featured application. It was efficient — not due to some brand new approach — but because of an advantageous combination of Avid’s existing solutions, automation, and facilitation of file processing, as well as the positive user experience it provided. Avid was satisfied with the result as well. This is why we were invited to showcase FileSystem Connector at Avid Connect in Las Vegas. This is a huge conference for thousands of Avid’s partners and customers from all over the world (including such giants as NBC or FOX). We presented the product just after the company CEO’s speech at the opening ceremony, and later we conducted a detailed technical session for the customers and partners. After Avid Connect, GlobalLogic and Avid presented the product to the TV industry representatives at NAB, the world’s largest exhibition for broadcasters. We experienced strong interest by prospective customers. Many users have long dreamed of such an obvious feature. However, it wasn’t easy to implement it within a framework of creating a complex product inside a big company. That is why our little startup came in very handy. We are continuously developing FileSystem Connector, such as adding new features and optimizing the performance of the existing ones. However, the most important and complex aspect of this project is not a technological one. It should be understood that GlobalLogic is a service provider, and developing our own products is not the company’s priority (GlobalLogic’s organization structure is simply not adapted for such activity). We would need to change the vision of our sales managers to build an appropriate sales channel for ready-made solutions. We would need to work tightly with the legal department to draft a user agreement and to control the licensing of the product. We would need to interact with the marketing department so that we could work out an effective positioning and a promotion strategy for our own products along with the company’s services. We would need to manage the process promo videos creation, as well as other types of advertising. Moreover, it is important to persuade the company’s management, which probably takes our project as a little experiment that will not necessarily hit the target. Obviously, it is quite hard to run a “classical” start-up. The same goes for our modest product project inside a huge service company. Every day we solve problems that have nothing to do with product development, we negotiate with the management team, and we look for uncommon solutions to our uncommon problems. Despite all the challenges, our plans are grand. We want to develop this initiative within other domains, where we already have the experience and understanding of business components of the products that we create. In other words, we want to level up these projects, combine them into a single practice, and offer a new kind of partnership to our customers. It may include the development of their product ecosystems by means of independent third-party applications, revenue-sharing contracts for development, counseling, etc. In fact, it is the primary motivation to further create our own products. Another point is that such projects help develop engineering talents. We felt that this initiative was an excellent experience for the team, which has obtained new skills and tuned up its product development approach. The ability to understand the customer’s business and independently find technical solutions for business tasks is probably the main thing that distinguishes code writers from software engineers these days. I believe that the importance of these qualities and the demand for them will grow further. Finally, internal startup-like projects help level up the company’s flexibility. Although a little alternative project can become a thorn in the side, I think that projects of this kind are the ones that help businesses adapt to change and stay innovative. As the saying goes, companies can be quick or be dead. So if a company decides to learn how to change, it should learn to do so quickly. All in all, I don’t want to say that this project will change GlobalLogic’s business model at once or that eventually all service companies will switch to product-making. Most likely, the service model will still dominate the Ukraine market for many years to come, mostly because of the legal and regulatory environments’ imperfection. On the other hand, I am sure that specialization in certain promising areas (in our case, media asset management) can provide companies with an opportunity to develop a business based on their own solutions. And as for engineers, product-making provides a good background for professional growth, deep engagement in solution development, and a training in solving business tasks along with technical ones. This blog was originally published on DOU.ua on May 30, 2016 by Roman Cherednyk, a senior engineering manager at GlobalLogic Ukraine.